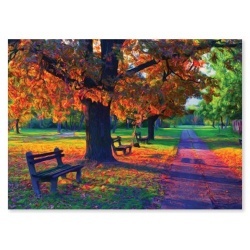 You'll feel like you've jumped into a painting with this gorgeously illustrated 33-inch wide x 24-inch tall cardboard Walk in the Park 1,500 Piece Jigsaw Puzzle featuring benches and trees lining a picturesque park path! The high piece count makes for a more challenging puzzle experience that's great for adults and children, ages 12 and up. 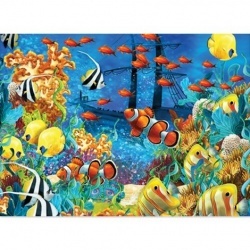 Dive right into this 33-inch wide x 24-inch tall cardboard Shipwreck Reef 1,500-Piece Jigsaw Puzzle featuring a colorful image of tropical fish, a thriving coral reef, and a mysterious shipwreck! The high piece count makes for a more challenging puzzle experience that's great for adults and children, ages 12 and up. If you like comicbooks and puzzles, you're in for a treat! Stay busy for hours with DC Comic's sensational heroes. 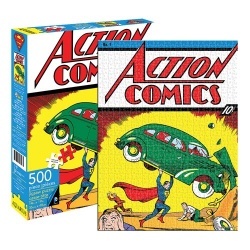 The Superman Comic Cover 500 Piece Puzzle measures 14-inches x 19-inches when completed. For ages young and old, this pocket puzzle is a little easier to contend with! 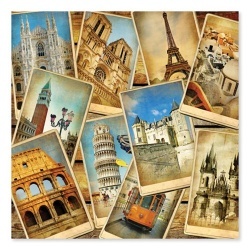 The pocket puzzle design offers bigger pieces and a smaller size for portability, so everyone can enjoy some puzzling fun. 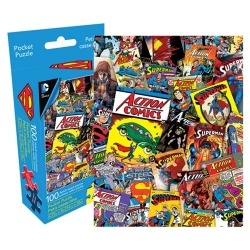 This Superman Collage 100 piece Pocket Puzzle measures approximately 8-inches tall by 6 1/4-inches wide when completed. Hit the ice with your favorite teammate! Carey Price is wearing his red Montreal Canadiens jersey. 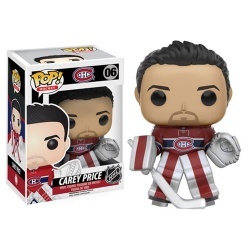 The NHL Carey Price Pop! Vinyl Figure measures approximately 3 3/4-inches tall and comes packaged in a window display box. Very Important: Points can not be used towards this purchase. Mickey and Minnie take to the ice in festive, cozy, winter clothes. 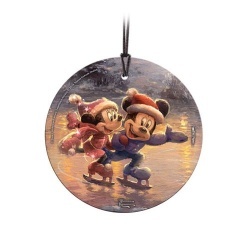 Thomas Kinkade Studios takes the most-beloved sweethearts on a frosty, wintery holiday on this delightful Disney Mickey Mouse and Minnie Mouse Sweetheart Holiday Thomas Kinkade StarFire Prints Hanging Glass Ornament. Translucent yet vibrant with color, the light-catching properties of the glass ornament illuminate the image and make for a perfect Christmas tree ornament or year-round décor, and it comes with a hanging string for easy display. StarFire Prints hanging glass are photographic quality prints on translucent glass. Featuring artwork from your favorite movies and more, they're an elegant way to display your fandom to the world. The images are permanently fused into the glass, resulting in a semi-translucent print that captures the natural light, enhancing the color display and making each image a true piece of art. The glass is scratch and fade resistant and arrives to you ready for display. Mickey Mouse shows off his Christmas Spirit on this wonderful Mickey Mouse Merry Christmas Hanging StarFire Glass Print. 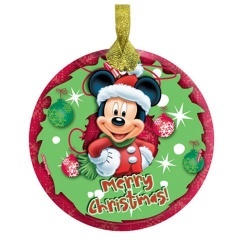 Help one of the most iconic characters in cinematic history celebrate with this beautiful 3 1/2-inch circular Mickey Mouse Merry Christmas Hanging StarFire Glass Print. Translucent yet vibrant with color, it's designed to capture the natural light, making every image a true piece of art. The glass is scratch and fade resistant, ready for display. Show it in a window or on a tree to bring the holiday spirit to your home!